Since I’m tired of whining about work, let’s just say it was another insane day with too much going on and not enough bodies. This isn’t gonna be an easy week, things aren’t lightening up anytime soon. When I know I’m gonna be under a lot of stress, I like to eat especially well since immunity tends to suffer under stress. That can be an issue with limited time and energy after a frying day, but that’s what I like about so many raw recipes – they’re quick and easier than cooking. 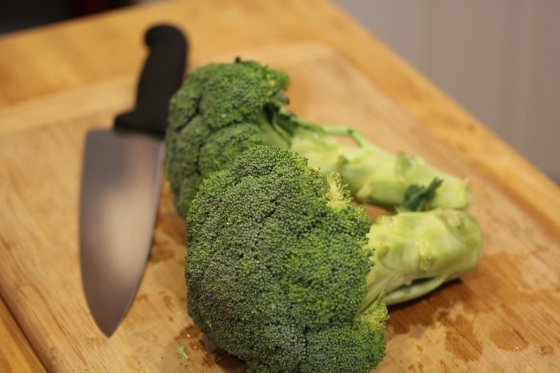 For dinner I decided to go with a simple raw dish, Protein Punch Broccoli. 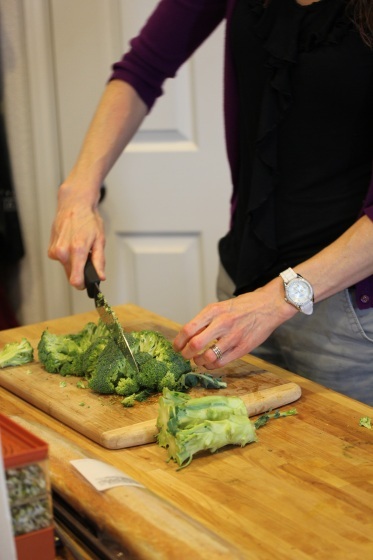 Usually chopping broccoli into neat little florets is a time-consuming art. But when its just getting thrown into a food processor, sloppily hacking away at it is kind of therapeutic. 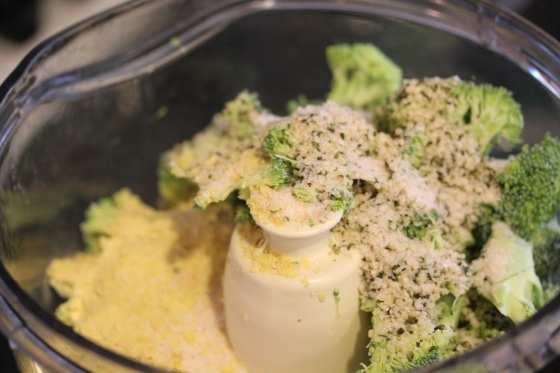 Hemp seeds, broccoli, nutritional yeast, and garlic can’t be wrong together. 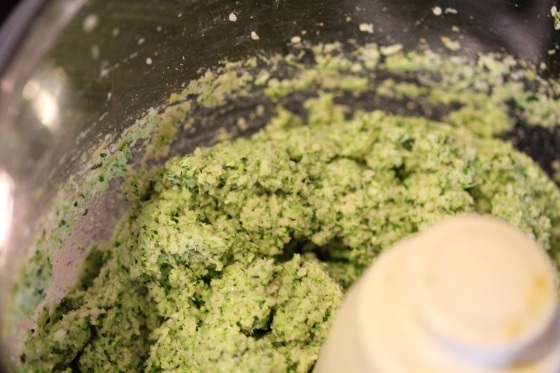 Especially when a good food processor can turn them into a smooth pate. 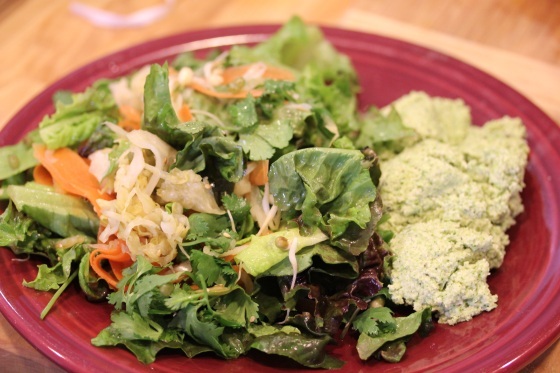 I paired it with a salad trying yet another new home-grown sprout – sprouted mung beans. Anyway, I tossed the spouts into a simple salad of romaine lettuce, sauerkraut, carrots and chopped cilantro dressed with a splash of toasted sesame oil. Hacking away at a head of romaine was also therapeutic. 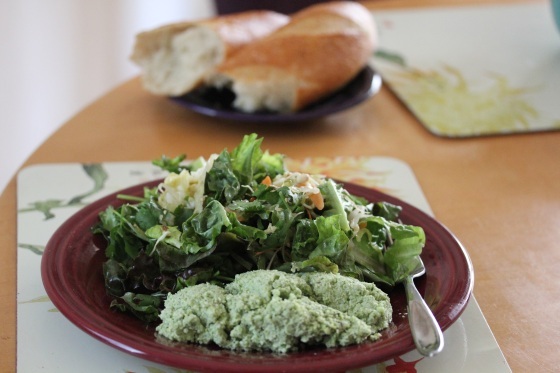 The result was a very green dinner with the protein broccoli pate. 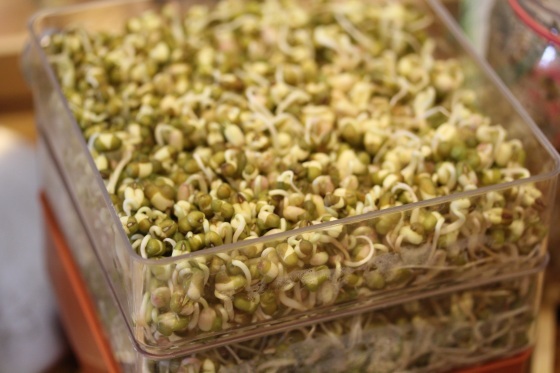 Mung bean sprouts are tasty, a little nuttier than alfalfa sprouts and added a fun texture to the salad. What’s therapeutic for you after a stressful day? yoga is the ultimate therapy for me after work! your meal looks great and thanks for the sprout links and good to know they appeared to be doing nothing but got their game face on in the end! True, my Google reader actually reached over 1,000 today because I’ve been too busy to keep up with it and I hate that! This broccoli pate looks great– very unique! 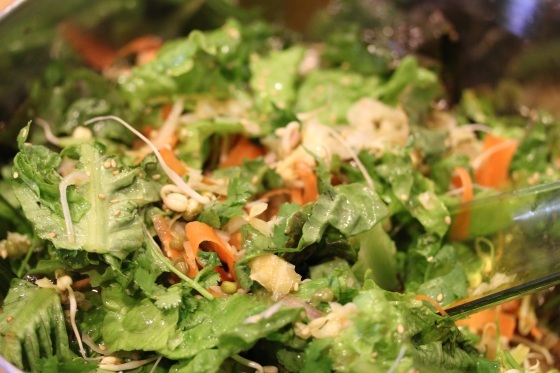 Love the sprouted seeds and super salad!